At breakfast, we all brought our various medications. Helene persuaded Deirdre to take Ginkgo Biloba since Deirdre was allergic to an ingredient in acetozolamide (Diamox.) After breakfast, Helene and I asked Kapanya to step outside and we told him that (at Randi Woythaler's suggestion) we wanted to hire one additional porter to carry our daypacks because we really wanted to make it to the top of the mountain. He said, "O.K." As we were driving to Londorossi Gate to register with the park service, we saw a Crawshay's Hare leaping through the lava field. Then it started leaping on the road in front of us. It wouldn't get off the road. It was trying to keep ahead of the jeep. We all yelled, "Just get off the road and we won't run you over!" Deirdre said, "Now we know where the phrase "hare-brained" comes from." We saw a Whistling Acacia tree which is a tree with thorny balls. Safari Ants live inside the balls and there is a hole in the ball and when the wind blows, the holes make a whistling sound. We signed in at the park station and took photos with the entrance signs. I accidentally called Andy "Bobby" (which is Andy's brother's name) and Andy was not happy about it. I made sure I never made that mistake again. I learned that when people said, "Mambo?" (how's it going?) to me, I was supposed to say, "Poh-ah" (fine) in response. We then left the gate and drove another 45 minutes to the trailhead. 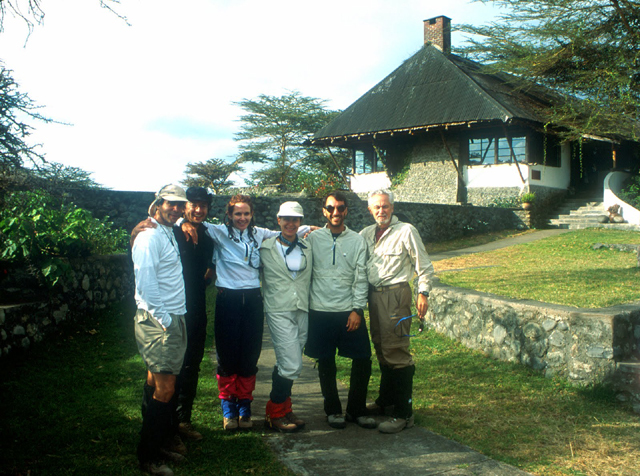 When we arrived at the trailhead, we saw about 100 African men who were going to accompany us on our expedition. Kapanya introduced us to the guides and the cooking staff. All of the staff pronounced Helene's name "Helen." She wasn't crazy about that. 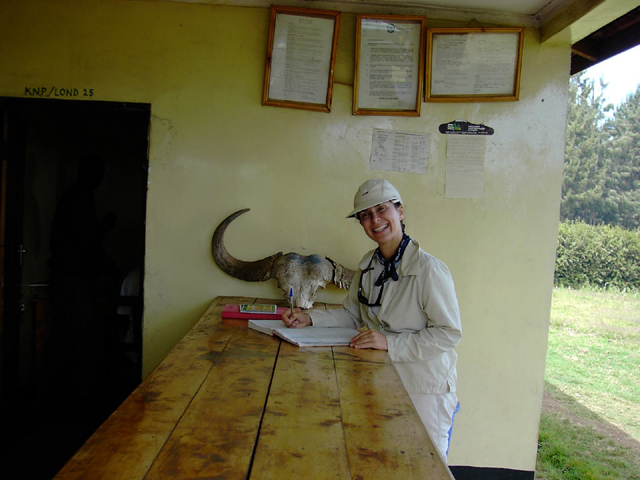 I reminded Kapanya that Helene and I wanted our own personal porter to carry our daypacks. He said he remembered and Helene and I left our daypacks with him and set off for the trailhead carrying only our Camelback drinking system. We left the trailhead around noon. The first part of the trail was relatively steep, but it was a lovely walk through a lush forest with hanging vines, and moss on the trees. We stopped for lunch around 1:30 p.m. 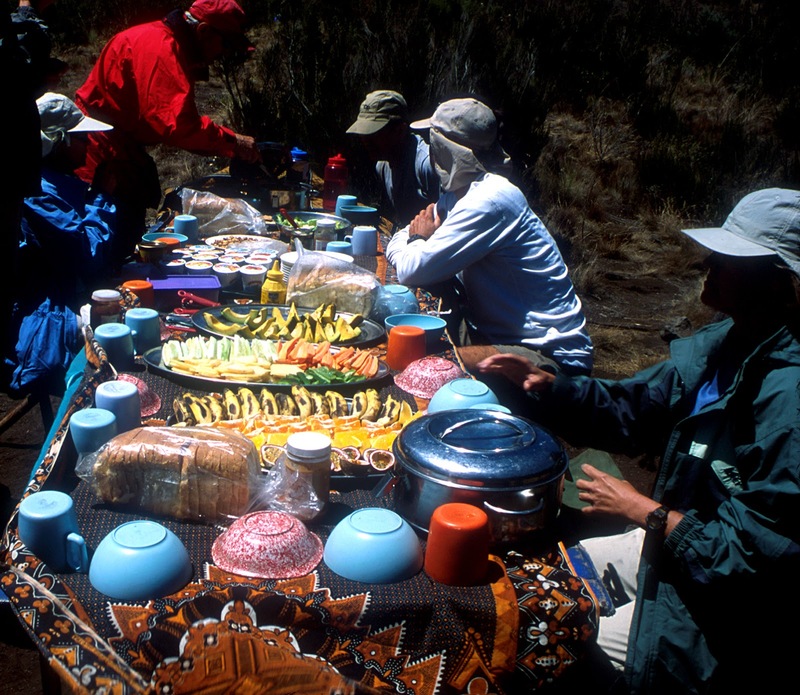 There was an amazing lunch prepared for us right in the middle of the forest. Kapanya forced us to eat more than we thought possible. Helene and I met our daypack porter, Joshua. The one negative about the rest of the trail was the stinging nettle plants that lined the trail. I think we all came away un-stung though. 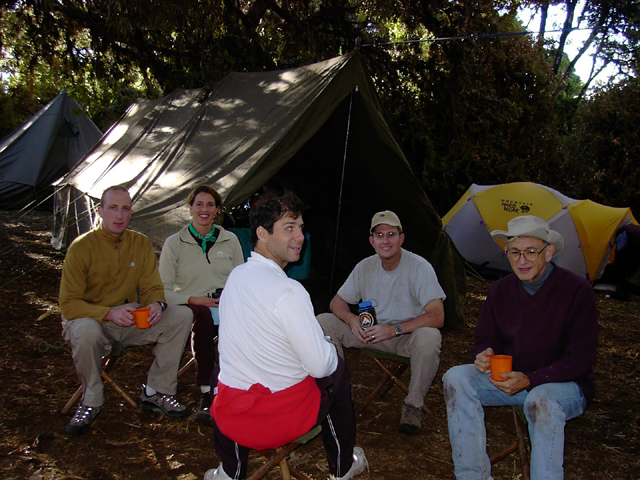 When we arrived in camp around 4:15 p.m., the porters who carried Helene's and my expedition gear, Saidi and Kumongusho, brought us tubs of hot water and soap for washing. They offered to inflate our Thermarests for us. Frank took one look at our Thermarests and asked how thick they were. I said "Two inches." Frank said something like, "One inch ought to be enough" and I replied, "Helene and I prefer that extra inch." Frank laughed and said, "Size matters!" I changed out of my hiking clothes into some lightweight sweats and Kapanya took one look at me and sent me back in my tent to put on a few more layers. The cooking staff served popcorn, biscuits and hot drinks in the mess tent. Kapanya made me eat and drink. Kapanya introduced the ladies to our garden toilet. It wasn't so bad. A square, three-sided tent surrounded a four-legged toilet seat under which was a two-foot deep hole in the ground. There was a pile of dirt and a shovel inside the tent and to "flush" the toilet, we simply shoveled some dirt into the hole. 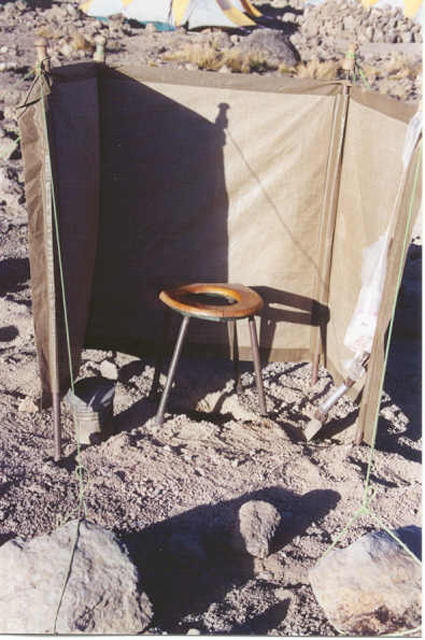 Rolls of toilet paper hung off the tent pole and a tin trashcan for refuse sat at the edge of the tent. Helene was quite delighted that there was actually a toilet seat to sit on. The views were always lovely from the camp toilets. 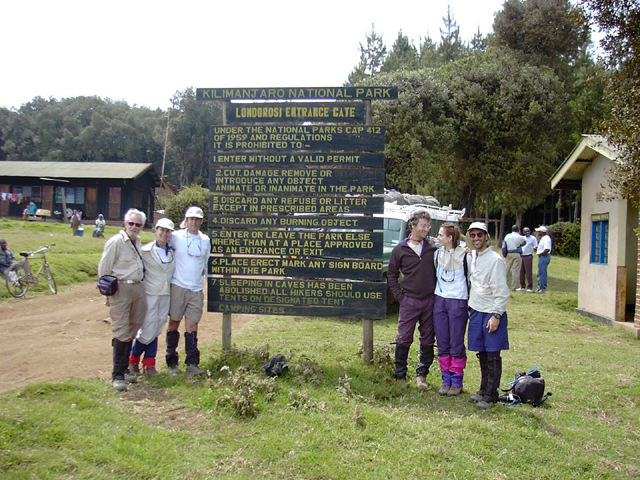 The most memorable view was of the glaciers in the summit crater. Larry used his satellite telephone to check in at home and he returned with some sad news. My maternal grandmother, Rachel Katz (a.k.a., "Nammy"), died at 12:35 a.m. at the age of 91. Larry and I looked into travel arrangements back for the funeral, but we were in the middle of a jungle in Africa and there were some other complications to consider, so we decided to remain where we were and walk on the roof of Africa, close to the heavens, and keep Nammy company as she traveled to the next world.